The world elite from the cross-country skiing scene will head to Oberstdorf at the beginning of January. Straight after New Year, Oberstdorf will host its second major sporting event of the winter: two stages of the FIS Tour de Ski, the world’s most prestigious cross-country skiing series, will be held on the World Championship trails in the Ried arena. Mountain hut magic and live music. 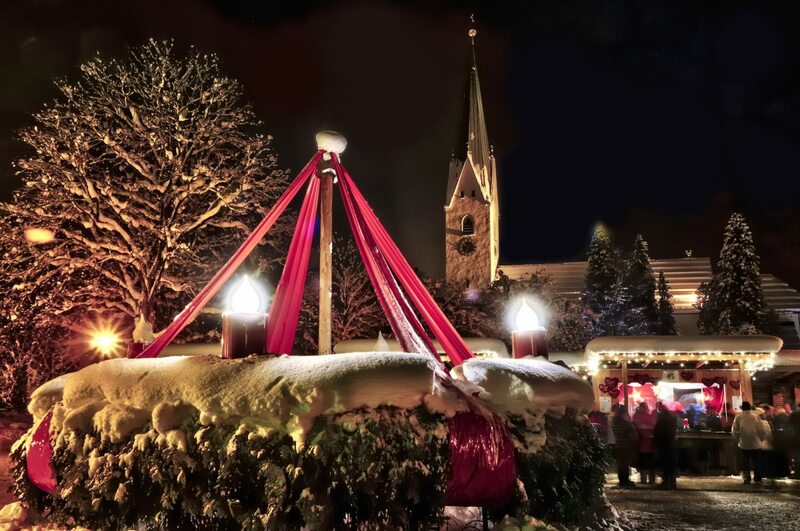 Enjoy the evening with a mug of mulled wine, a hot Caipirinha or a traditional punch and try the Allgäu delicacies and culinary delights on offer from our local establishments. Top live bands generate a merry atmosphere and that party feeling. The longest outdoor bar in the Allgäu and our DJs show that they really know how to party. At Easter time, Oberstdorf offers all sorts of Easter-egg-themed fun and games for kids as well as plenty of excitement for adults too. Young visitors can look forward to activities such as making their own Easter candles, egg-painting, kids’ cookery classes, an exciting visit to the fire station, handicrafts with hay, pottery,... and much more! Gebirgstälerlauf (Mountain Valley Run) - The 21.1 km route includes a tough 350 metres of elevation gain but breathtaking scenery in the great outdoors. 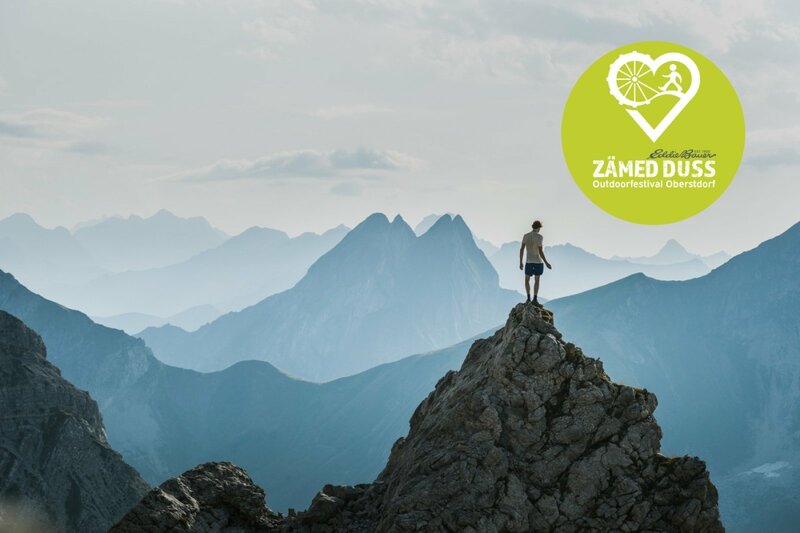 Nature, hiking and photography can all be jointly enjoyed at Europe’s highest photo festival! Everything will revolve around photography in June . A fun and diverse photography-related programme awaits Oberstdorf visitors. With photography hikes, a photography bivouac, photography fun for children, exhibitions, outdoor photography installations, a diverse range of workshops, beginners’ courses, multi-vision shows, a photography competition, a print centre and much more, there is plenty to excite both avid photographers and general visitors to Oberstdorf during the photography festival..
Oberstdorf vaillage festival With the help of the Oberstdorf clubs and associations, the Kurpark, market square and parish church garden will be transformed into a colourful fairground with live music, dancing, games, food and drink. tasty regional treats and fantastic entertainment from our carefully selected live bands. 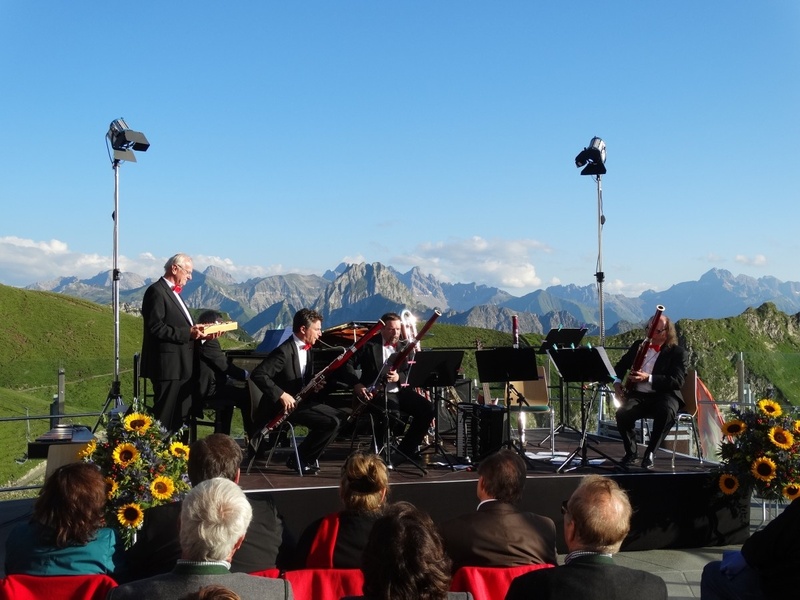 The Oberstdorfer Musiksommer (“Oberstdorf Summer of Music”) is the biggest classic music festival in the Allgäu. During July and August it attracts guests with remarkable concerts in the valley and on the mountain. The Oberstdorfer Musiksommer festival presents a fine selection of artists and topclass musical events. Guest performers include well-known international ensembles, soloists, young award-winners and up-and-coming talented young musicians. 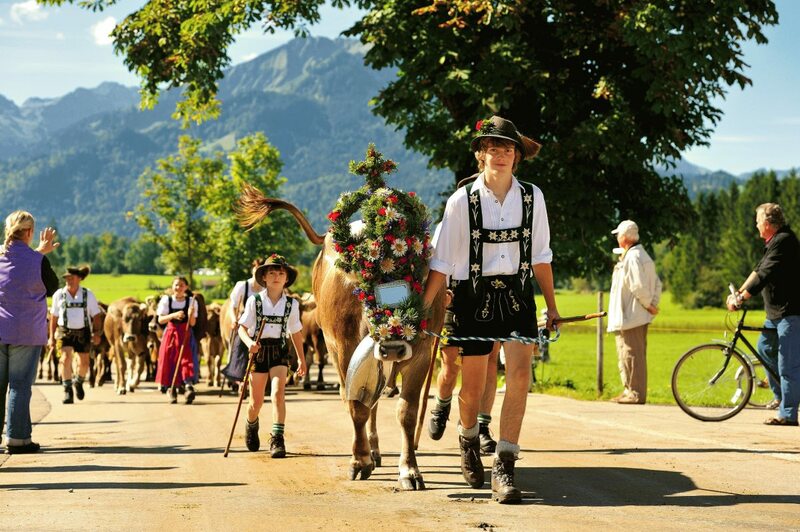 When the grazing period comes to an end in September it’s time for the Oberstdorf and Schöllang “Viehscheid” days. These tradition-steeped cattle drives mark the end of the summer in the Alpine pastures.The cattle drives on mid-September are a long-standing tradition.This unique event is accompanied by an impressive community festival with brass band music, hearty traditional dishes and superb Allgäu beer. An open air event in the Kurpark Cabaret, comedy, live music, poetry, shows Oberstdorf loves its performing arts. Whether locals or visitors, young or old – our kleinKunsttage (performing arts days) offer something for everyone. An international figure skating competition. As for the last few decades, at September, Oberstdorf will once again become the centre of the figure skating world. Oberstdorf will celebrate harvest festival with its farmers’ and cheese market in the centre of the village. A varied programme with lots of local products to sample. These not only include excellent Allgäu cheese but also many other regional specialities and rural handicrafts. A varied programme is on offer from the Alpine schools, ski schools, Oberstdorf·Kleinwalsertal Bergbahnen, paragliding schools, bike schools and many other organisations.The entire Kurpark complex will be packed with opportunities for visitors to obtain information and advice, view a wide range of sporting activities and try out equipment. A diverse supporting programme takes place during the day with lectures, film presentations, slide shows and multi-vision shows and concerts. The “Gallusmarkt” shopkeepers’ market takes place on the streets in and around the church. 300 market stalls offer visitors everything they could need for home and garden. As well as clothes, toys, pottery, flowers and much more. Oberstdorf awaits the eagles! Start of the Four Hills Tournament in the Oberstdorf World Championship Ski Jumping Arena at the end of december. As the year draws to an end, over 35,000 spectators will once again pack the World Championship Ski Jumping Arena to celebrate the start of the Four Hills Tournament. 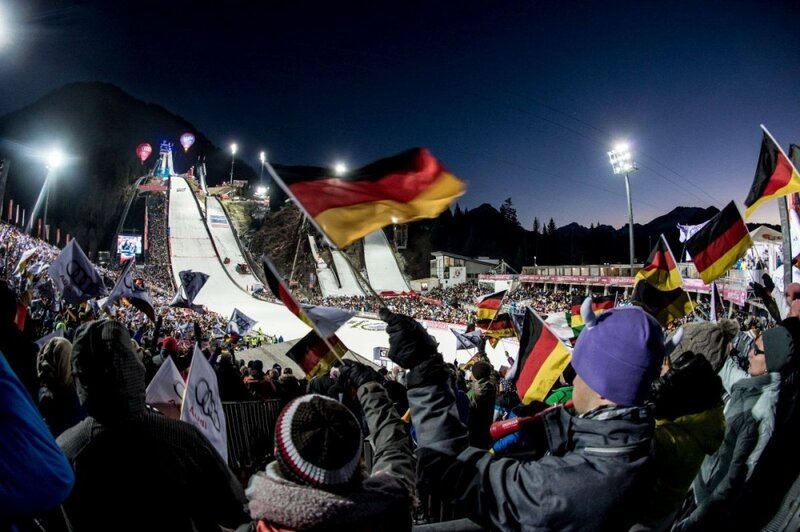 As per tradition, the world’s most prestigious ski jumping series will kick off in Oberstdorf at the end of December. And the winner of the first jump will automatically become the favourite for overall victory. Whether lively or profound in Oberstdorf dialect, traditional melodies or classic songs – transport yourself back to days gone by and escape everyday life. 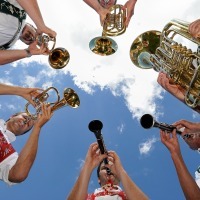 Many Oberstdorf groups such as alpine horn blowers, yodellers or the local band also contribute to the merry atmosphere. You can also look forward to music from people in traditional costumes, dulcimer music, readings and poetry in local dialect. We offer a lot of events all year round to make your holiday unforgettable. Many spectators, locals, helpers and athletes still vividly remember the winter fairytale of 2005. And these fond memories are making the excitement surrounding 2021 all the more tangible. This will be the third time, after 1987 and 2005, that the FIS Nordic Ski World Championships are held in the Allgäu. For about two weeks, everything in the region will revolve around Nordic skiing. The world’s top athletes in the disciplines of ski jumping, cross-country skiing and Nordic combined will be slugging it out for the title of World Champion both on the slopes of the Schattenberg and on Ried’s cross-country skiing trails. That means plenty of excitement and lots to do for visitors to Oberstdorf over the days of the competition. To be sure you don’t miss out on this winter sports highlight, come back to visit Oberstdorf again in 2021!